The Williams Sound FM 458-12 NET D PRO Personal PA FM Assistive Listening System with Network Control and Dante Input is a complete turnkey solution designed to help individuals needing auditory assistance or language interpretation overcome background noise, reverberation, and distance from the sound source. It includes a PPA T45 NET D transmitter with Dante audio input and network control capability via Ethernet, 12 PPA R38N bodypack receivers, each featuring an OLED display and on-screen channel selection with access to 17 preset frequencies, 12 EAR 022 surround earphones, and 3 NKL 001 neckloops. Ideal for large-group listening scenarios, the FM 458-12 NET D PRO provides crystal-clear sound anywhere within an operating range up to 1000'. The system is expandable with additional PPA R38N bodypack receivers (available separately) to accommodate any number of listeners. Also included is an ANT 025 whip antenna, an ANT 005 coaxial antenna, an RPK 005 rack panel kit, a TFP 048 power supply, a WLC 004 main power cord, a 3' WCA 013 RCA audio cable, a CHG 351212-bay charger with 12 2-packs of AA NiMH rechargeable batteries, and an IDP 008 ADA wall plaque. The cutting-edge PPA T45NET D transmitter offers control or monitoring capability from any remote location, multiple digital audio input options, and an OLED high-resolution screen with easy-to-manage menu navigation. It's technology that takes the guesswork out of complex audio installation. 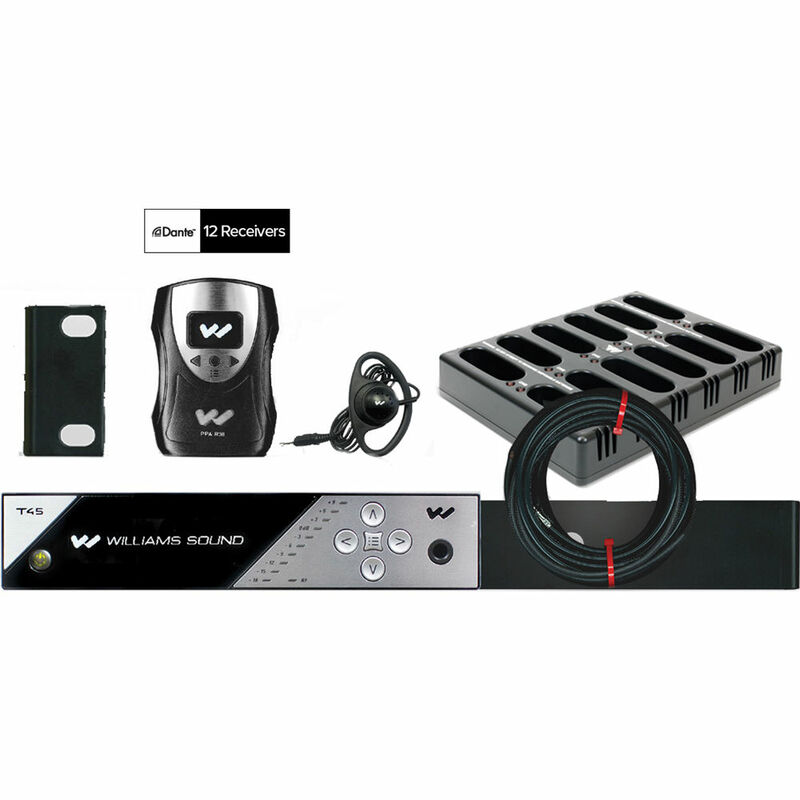 The Williams Sound NKL 001 is an induction neckloop designed to magnetically couple an audio signal to a telephone coil-equipped (T-Switch) hearing aid. The neckloop has a standard 1/8" mini plug that can be connected to any audio device that has an 8-16 Ohm 1/8" output, such as a beltpack receiver, TV, tape player, etc. The neckloop has a slider so you can adjust the tension, and the 18" cord provides a good amount of slack for use with body-worn devices. The Williams Sound ANT005 is a 22' coaxial antenna designed to be used with any personal PA system or large-area FM transmitter that operates at 72 to 76 MHz. It provides the system with a maximum operating range. The Williams Sound ANT025 is a telescoping whip antenna intended for use with the T45 personal PA transmitter. The IDP008 from Williams Sound is a self-adhesive wall plaque that alerts your patrons to the fact that your establishment has a hearing assistance system. Perfect for theaters, auditoriums, and more, the plaque is large and easy-to-see. The RPK005 from Williams Sound is a rack mounting kit that allows you to mount 1/2 rack space products in a standard audio rack. The TFP 048 Power Supply for PPA T45 and PPA T45Net from Williams Sound can be used as a power supply for Williams Sound PPA T45 and PPA T45NET. Please note, line cord not included. The three foot WCA 013 RCA Audio Cable from Williams Sound is a standard RCA phono male to RCA phone male cable, designed to be used as an audio input cable for the company's PPA T27 and PPA T35 personal PA base station transmitters. The cable can also be used in any application that requires unbalanced audio connectivity using RCA connectors. The black 7.5' WLC 004 3-Pin US Main Power Cord from Williams Sound can be used with CHG 3512 3V 12 unit charger, CHG 3512 PRO 3V 12 unit charger with case, IC-2 interpreter control console, and WIR TX75 mid-range infrared transmitter. Box Dimensions (LxWxH) 12.5 x 11.25 x 4.25"
Box Dimensions (LxWxH) 6.2 x 6.2 x 1.9"
Box Dimensions (LxWxH) 10.35 x 2.0 x 0.4"
Box Dimensions (LxWxH) 7.3 x 4.3 x 0.1"
Box Dimensions (LxWxH) 9.8 x 4.5 x 0.5"
Box Dimensions (LxWxH) 4.4 x 2.0 x 0.5"
Box Dimensions (LxWxH) 3.1 x 2.5 x 0.4"
Box Dimensions (LxWxH) 5.5 x 5.5 x 0.875"